HALIFAX -- A decision regarding automatic suspensions stemming from a wild weekend hockey brawl between the Acadia Axemen and St. F.X. X-Men is expected to be released Wednesday morning. Atlantic University Sport, which oversees university sport in the region, said Tuesday that men's hockey commissioner Dave McLean and AUS executive director Phil Currie were still examining video footage and reviewing the numerous infractions from the game. Following the automatic sanctions, the AUS disciplinary process will continue and further supplementary discipline will be handed down once the review has been completed, AUS said. "On the whole, this egregious incident flies in the face of our regulations, our policies and our values," Currie said in a statement. "Our student-athletes are students first and as such, our conference does not tolerate violence. Both Acadia and St. F.X. have been and will continue to be consulted throughout this process. We are aware of the allegations that have been brought forward by St. F.X. concerning comments made by involved parties during this incident. "Both the nature of these allegations, as well as the dangerous events that ensued during Saturday's game, are distressing and are being taken very seriously. We continue to move forward with our review of this incident. Our focus has not changed. We will review this matter diligently and the repercussions will reflect the serious nature of the actions of those involved." 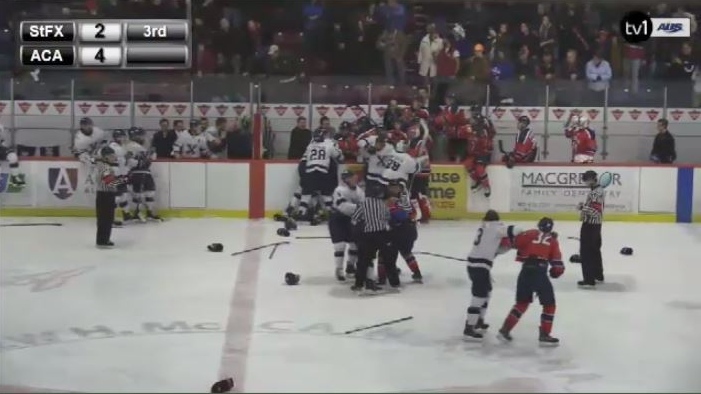 The brouhaha occurred in the third period of last Saturday's game in Wolfville, N.S., leading to the ejection of five Axemen players, eight X-Men and both head coaches. Suspensions will take effect immediately and be in place for the teams' next scheduled games, AUS said. Videos posted to social media show players on both teams hurling profanities, striking each other, and grabbing each other's jerseys near the Acadia bench during the brawl. After a 20-minute delay, the game continued and Acadia won 6-3. Bryce Swan, a former Quebec league star who went on to play for St. F.X. for four years, has watched the video of the brawl several times. Swan has also read the statement from X-men player Sam Studnicka, which alleges the brawl was sparked by the shaming of a sexual assault survivor. Studnicka says it has been going on for three years. “It’s very serious what Acadia is being accused of,” Swan said. While Swan doesn't want to publicly weigh in on the validity of the allegations, he says when it comes to hockey’s code, this is what teammates do; they stick up for each other. Beyond the suspensions, Swan says he's more concerned about the person involved -- who wasn't even on the ice. “I think of the actual victim and what they went through and unfortunately it's being put into public sphere,” Swan said. Acadia is scheduled to play at Saint Mary's on Wednesday night. St. FX is set to return to action Friday at the University of New Brunswick. With files from CTV Atlantic’s Paul Hollingsworth and The Canadian Press.